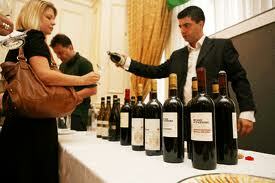 Next weekend, May 10th, is Decanter’s Italian Fine Wine Encounter. I always enjoy going to these events because it’s the perfect opportunity to meet and taste some fabulous Italian wines. I love Italian wine but sadly, I never seem to have the time to really get to know them. Decanter’s tasting serves as a good reminder of all that Fine Italian wine has to offer. This year, the event is going to be held at the centrally located Lancaster Hotel, almost directly across from Marble Arch tube station. There are going to be more than 300 wines on offer in the Grand Tasting room including many iconic Italian wine producers. As well as the Grand Tasting, there are going to be a number of Masterclasses – tutored tastings so that you can really get to grips with Italian wines. Looking at the list, I’m very interested in the Barolo masterclass, I always forget how fascinating those wines are. If masterclasses aren’t your thing, there will also be a series of informal tastings featuring 6 wines in the Discovery Theatre. The theatre is going to be run by my friends over at Vini Italiani so I know that they’ll not only be a lot of fun but also very informative. There will also be book signings by Monty Walden of the Chateau Monty TV series and Ian d’Agata author of Native Wine Grapes of Italy by the bookstand. I go to the tasting almost every year and it’s always good fun and serves as a reminder that I really do need to get cracking on my Italian wine knowledge. So many wine regions, so little time…. For more information on where to buy your tickets, visit the Decanter website.